Receive expert assistance designing and developing comprehensive next generation science assessments and assessment systems. Realize the shared vision of a science assessment informed by principles of assessment design and that reflect local needs, emphases, and interpretations. WestEd is a recognized leader in the development of next-generation assessments, working directly with individual states, or with cross-state groups, to develop next-generation science assessments that are informed by principles of assessment design and reflect local needs, emphases, and interpretations. We take an evidence-based approach to all stages of development, to ensure that the assessments are valid, fair, and reliable measures of students’ science knowledge and abilities. We facilitate an iterative, multiple-stage process, with policymakers and education stakeholders, to gather input in order to develop a customized solution for a comprehensive science assessment system. Both online and paper-and-pencil assessments can be designed and developed. 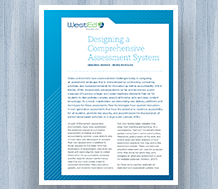 In addition to facilitating needed collaboration throughout the process, WestEd helps to engage education stakeholders in the design, development, and support of the new science assessments. Our process includes development of key documents such as assessment frameworks and item specifications; innovative item design and prototyping; and item development. Our services are customized to each client’s context and needs. We work with clients in the collaborative design and development of next-generation science assessments, serving as a thought partner to realize the shared vision of a science assessment informed by the principles of assessment design. Through symposiums and focus groups, pilot and field tests, and summit meetings, our team helps clients engage stakeholders and make informed decisions about the usefulness of particular decisions and assessments for measuring student progress in science content. 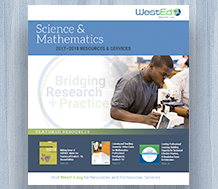 WestEd’s Standards, Assessment, and Accountability Services (SAAS) program includes a dedicated and versatile team of science content, instruction, and assessment specialists. The SAAS team has deep instructional and assessment expertise, as well as extensive experience working with federal, state, and local education agencies, and nonprofits (e.g., Council of Chief State School Officers, The College Board), in designing and implementing comprehensive assessment systems. The SAAS team develops prototypes and documentation based on the needs and expectations from clients, then facilitates iterative cycles to fine-tune the documentation while staying true to industry expectations. WestEd also adheres to the research standards established by the American Psychological Association (APA). CCSSO Science Assessment Item Collaborative: Facilitated input and needs from 15 collaborative members to develop NGSS Assessment Framework, Item Specifications Guidelines, and NGSS item cluster prototypes. These documents can be accessed at the CSAI Science Assessment Item Collaborative spotlight page. Cost varies depending on the scope of work and needs of the client. Cost is affected by the degrees of technical support, meetings, and travel needed. To learn more, contact Kevin King at 435.655.1229 or kking@wested.org. 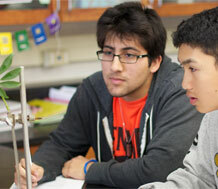 WestEd is a pioneer and leader in designing and developing comprehensive next-generation science assessment systems.